Il sito "ilpizzaiuolo.com" fa utilizzo dei “cookie” per permettere una migliore fruizione dei contenuti da parte dei visitatori. Di seguito le diverse tipologie di cookie utilizzati nel sito "ilpizzaiuolo.com"
Questa tipologia permette al sito "ilpizzaiuolo.com" di recepire informazioni sull’utilizzo del sito stesso. I dati sono raccolti in forma anonima e servono per effettuare delle analisi al fine di migliorare l’esperienza di navigazione sul sito e fornire contenuti adatti ai diversi visitatori. I dati vengono inviati da domini di terze parti al sito "ilpizzaiuolo.com"
Il sito "ilpizzaiuolo.com" non utilizza cookie di profilazione e secondo la normativa vigente, non è tenuto a chiedere consenso per i cookie tecnici e di analisi, in quanto necessari a fornire i servizi richiesti. 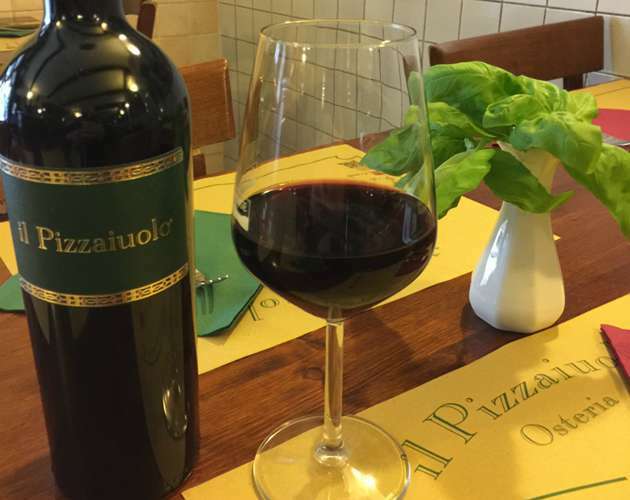 Just a few steps away from the S. Ambrogio local market you find one of the city's most historical pizzerias, Il Pizzaiuolo. 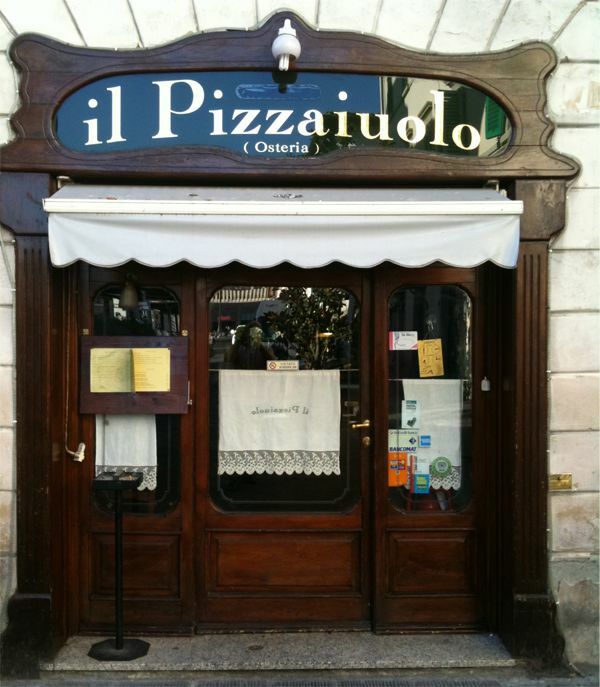 It is about a typical Neapolitan pizzeria restaurant established more than 20 years ago. Our restaurant offers a comfortable and inviting environment equipped with air-conditioning and disability access. Pets are welcome. A take away service is provided. Our mission is to create an extraordinary dining experience for the Customer. Away from the city's schemes, the Customer entering our place should feel like being in Naples, immersed in the same smells, flavours and sensations. Our goal is to see the Customer getting up 'with a full belly and a satisfied palate' and most of all happy with the bill. The Neapolitan cooking, whose old roots date back to the Greek-Roman times, enriched by the creativity and imagination of the Neapolitans through the ages, stroke the right balance between land food as pasta, dairy products and vegetables, and seafood as fish, shellfish and crustacea. We re-propose this mix of wisely cooked dishes faithful to the Neapolitan tradition even when naming the courses. 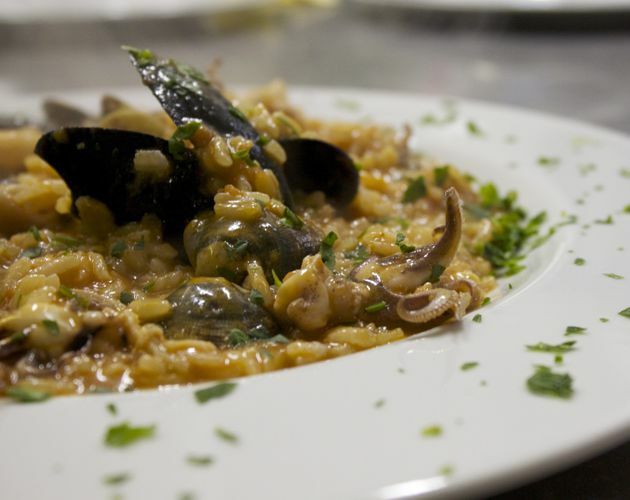 You can find: The Penne Scarpariello and Spaghetti Gaeta (among the land main courses), the Linguine Masaniello and the Spaghetti D'Angiò (among the sea main courses) or The Polpette Alla Napoletana and The Mozzarella In Carrozza (typical second courses). Finally the well-know Neapolitan desserts the Babà and the Pastiera. As a little concession of the Sicilian patisserie we allowed ourselves to serve the Cannoli and the Cassata. Pizza: The word 'pizza' simply awakes your attention. Lot of stories about it, countless classifications and assumptions on the most ancient origins of the pizza. We make the Napoletana Verace, which is very simple following the Neapolitan recipe and is cooked in the wood-fired oven. We focus on the quality of our products, which are seasonal products exclusively, respecting the territoriality and the Campania local provenance. In line with our menu we mostly selected wines from the Campania Region. The Campania wine-producing tradition dates back to the Greek colonization. The hilly topography of the land and the mild climate make this Region suitable for the rooting of various species of vines, among them many D.O.C.G. and D.O.C..
Our selection of white wine includes the classic Greco di Tufo, Fiano di Avellino, Coda di volpe and Falanghina, while among the red ones we suggest the D.o.c.g. Taurasi, the Aglianico and a special Rosé made from the Aglianico itself. After scrupulous checks, we chose the 'Vigne irpine' to stock our cellar, that is a young wine company located in the heart of Irpinia. 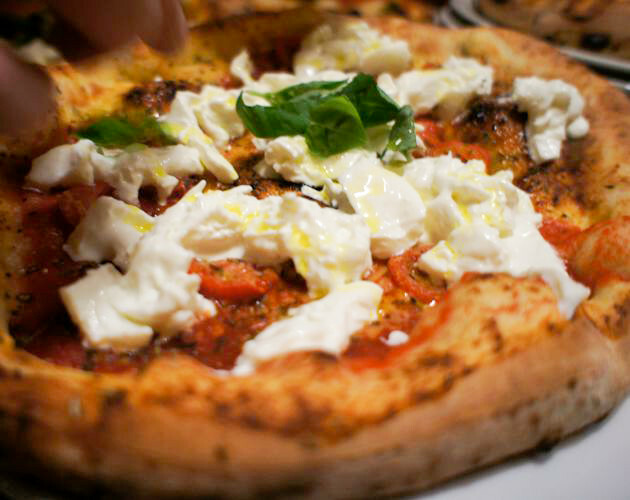 The authentic dough for the Neapolitan pizza is made of 4 basic ingredients: water, flour, brewer's yeast and salt. We only use Top-quality products to make our one (Caputo flour and fresh yeast). After kneading the dough we cover it with a wet kitchen towel and put it in a safe place away from currents until it doubles in volume (wind is the worse enemy for the rising process). We call this step 'puntata'. Later we shape the dough into panetti 'staglio' (balls), ours are 250-280gr, and let them rise for further 24 hours. We take great care of the dough balls during this time and move them into the fridge if needed or into a more humid spot depending on the climate. For a successful pizza the shaping is a crucial step. Only when the panetto (ball of dough) is well risen can be put in the oven. You see it when the dough is easy to stretch and work with avoiding the springy effect. At this stage we shape the pizza, which must be as round as possible, trying to push the air from the middle all the way to the edge giving the Neapolitan pizza the characteristic shape with a 1-2 cm high edge, the so called cornicione (outer edge of the pizza crust). The pizza must be crafted by hands only and no other tool is allowed. Last but not least the baking step. To make a doc Neapolitan pizza you need a wood-fired oven. Ours is a Valoriani, one of the best. Fire should be put on the left facing the oven to facilitate a regular hot air circulation inside the oven (clockwise), while the oven's mouth (entrance) should not be straight but slightly oblique in order to obstruct opposite currents that would make the temperature lower in some spots inside the oven. The ideal oven temperature is 485°C (905°F) and the cooking time is about 60-90 seconds until the cornicione (crust) gets charred showing the typical leopard's spots. The colour of a doc Neapolitan pizza is never uniform. An homogeneous colour would indicate a wrong oven temperature (too low) or even worse a scarce leavening process.